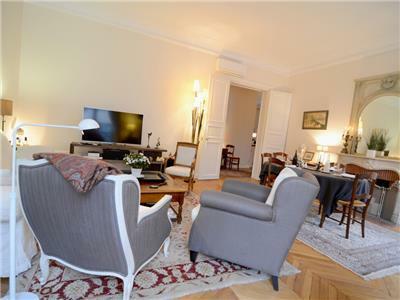 This elegant and spacious apartment is situated on the 4th floor of a classical stone building in an ideal location for sightseeing and shopping. Entering into the bright and welcoming foyer you are greeted with the sight of polished hardwood floors throughout and stylish furnishings. 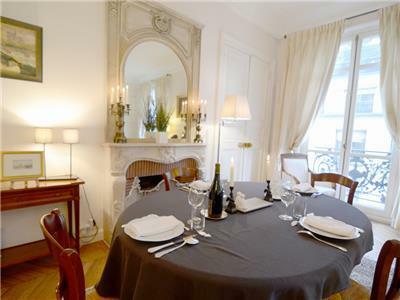 This leads into the living/dining room where there's a large dining table, perfect for entertaining guests when in Paris. The room also features a large TV screen, fireplace, a very comfortable couch and cosy arm chairs. 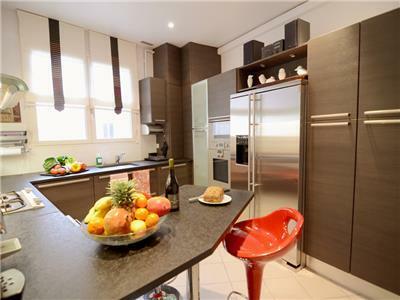 The large kitchen is modern in layout and very well equipped with a large fridge, 2 coffee machines and all the other essential appliances to make cooking just as easy as it is at home. 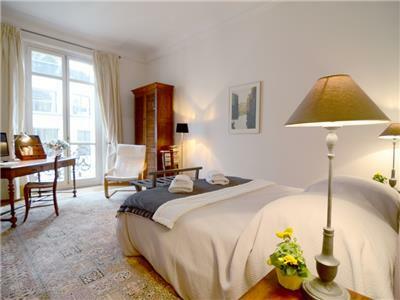 The 2 bedrooms are both generous in size and tastefully furnished. 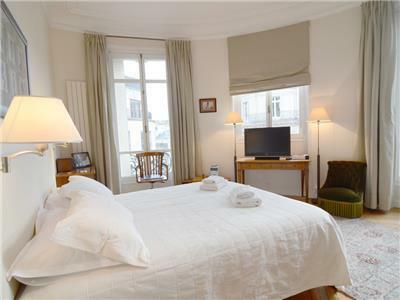 The main bedroom contains a queen size bed and has 3 large windows that face onto the picturesque Avenue d’Iena. 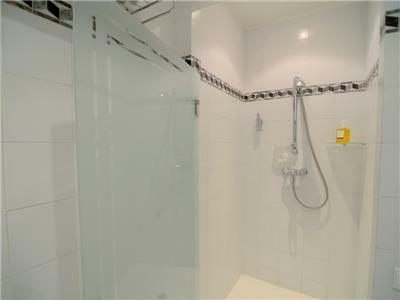 Adjoining it is a spacious ensuite bathroom with a toilet, sink and large bathtub with shower attachment. 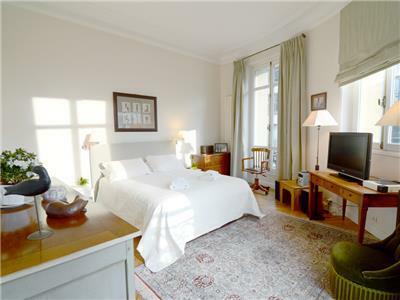 The second bedroom has a comfortable double bed, a desk and a grand fireplace. 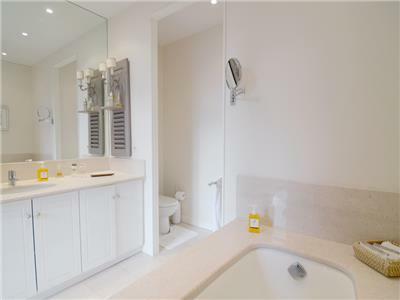 This room also offers an ensuite bathroom, featuring a toilet, sink and walk in shower. 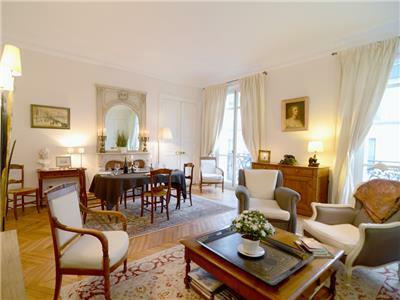 Our ‘Champs Elysées’ apartment is located on a tree-lined avenue, a stones throw from the Arc de Triomphe, considered to be one of the key symbols of Paris, built during the Napoleonic era. 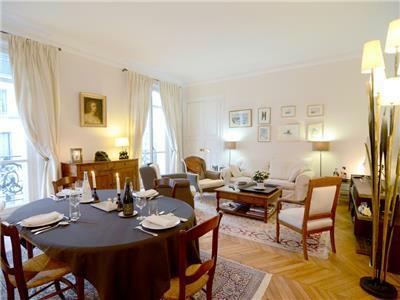 The apartment is situated almost at the border between the 16th and 8th arrondissements, both of which have historically been home to the Parisian aristocracy and boast beautiful, grandiose architecture. 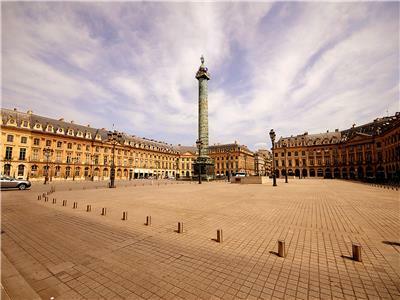 These districts are well known for high quality eating and drinking and most importantly, shopping. The apartment takes its name from the famous ‘Champs Elysées’ which is home to a plethora of high-end shops such as Louis Vuitton, Gucci and Chanel. 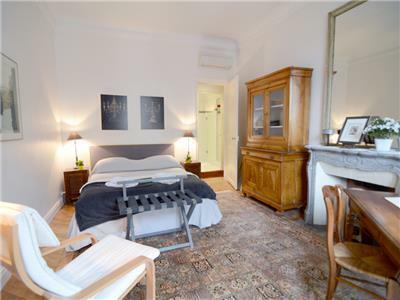 With links to the metro, buses and taxis all easily accessible from the apartment, this is also a perfect base from which to explore the rest of this phenomenal city. 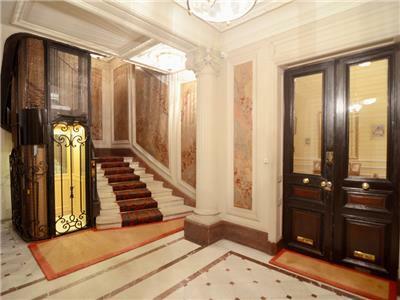 The nearest metro stop to the apartment is "George V" (line 1), which will link you up with the rest of the city. There are also buses, English-speaking taxis, and Uber easily available. ► A/C: This apartment has air conditioning in the living room, and both bedrooms. 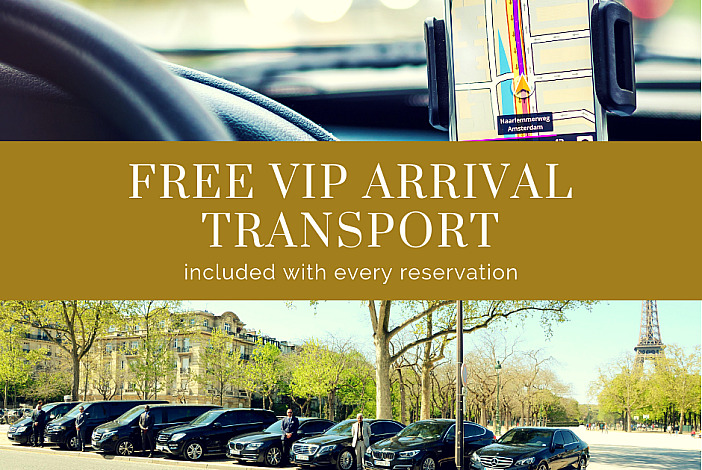 ► COMPLIMENTARY VIP TRANSPORTATION: We are happy to offer you a complimentary private car service from CDG/ORY airports or any Parisian train station for your arrival. Your English speaking driver will wait for your party outside the Customs doors/at the end of the relevant train platform, bearing a sign with your name. After he collects you, he will then call us upon your departure from the airport/train station so that your greeter can meet you at the apartment. A greeter will meet you, introduce you to the apartment, collect any final payment (if necessary), answer any questions, and give you the keys. ► WELCOME BASKET: We also offer you a “welcome basket” with basic goods (toilet paper, soaps, trash bags), a bottle of water, milk and other products that help start your stay in the best way. 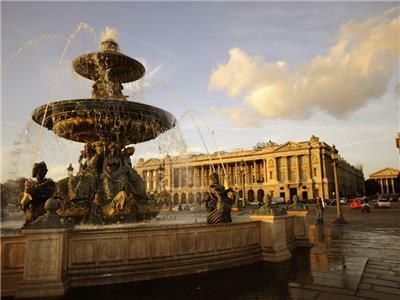 ► PARIS STAFF: Our team of Paris locals is available during your stay to satisfy all your needs. 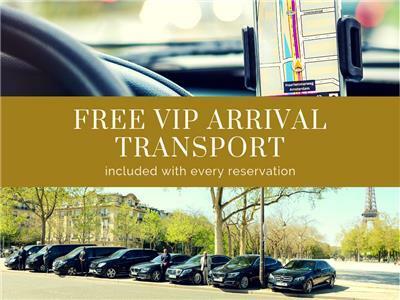 ► CONCIERGE SERVICES: We can also provide you concierge services: tourist advice for visiting Paris, restaurant reservations, babysitting recommendations and many other services that you can discover on our website. 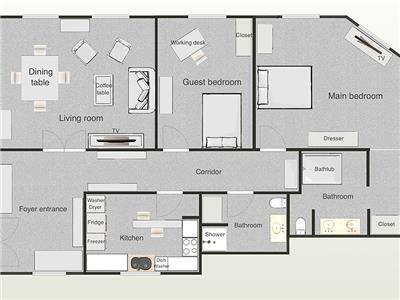 ► GUEST ACCESS: You will have access to the whole apartment. ► ALL-INCLUSIVE PRICING: Pricing displayed on our website is all-inclusive and does not include any additional fees. ► MINIMUM STAY: 3 nights minimum; 4 nights minimum during select periods. 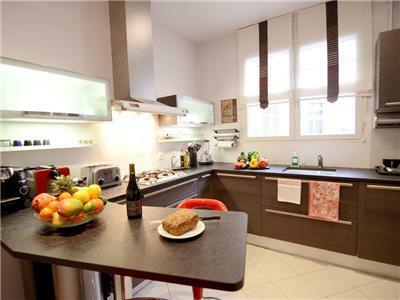 ► This property is managed by Holidays Europe Rentals. Bernard’s apartment was a treasure. The location was ideal, very close to views of both the Arc de Triumph and the Eiffel tower...hits with our kids. We traveled with two moms and two pre-teens so the apartment’s large size worked great for us. 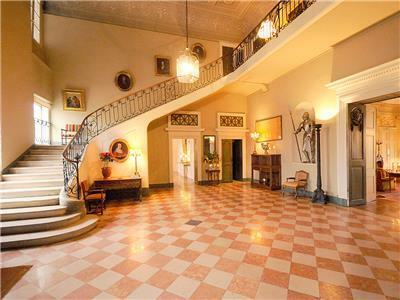 It was spacious and charming. There was a nicely thought out list of restaurants and local spots ready when we arrived. Any questions were answered right away. And he provided a pick up service for the airport which was a huge plus! 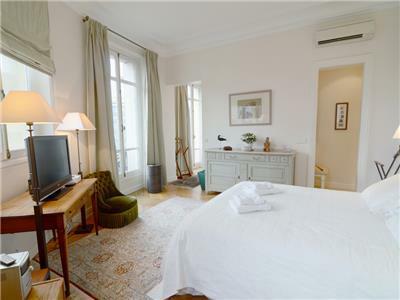 Overall we loved our very Parisian stay thanks to this gem of an apartment. Everything we had hoped it would be! Bernard's place helped make our Paris trip for our granddaughter everything we had hoped it would be. It started with our pick up at the airport which was very efficient and very comfortable transportation to the apartment. There we were able to get into the apt when we arrived around noon unlike most hotels. We were greeted and helped with the luggage. Bernard then arrived to formally greet us and assure that everything was ok. The apt was spacious with updated kitchen and bathrooms. 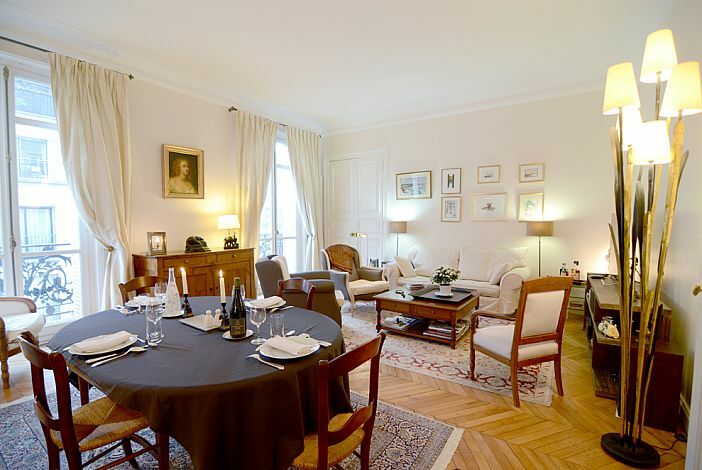 The location was superb with the champs elysees, arc de triomphe, and three metro stops just 5 minute walks away. Many restaurants to chose from within a few blocks. Half a block away was a grocery store with all that you would need including bread and pasteries baked on premise daily. Amazing! The whole experience from contact with host to location of apartment was amazing. 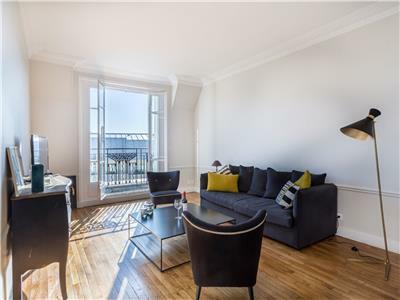 The apartment is stunning and in a great location. Bernard was a great host and very helpful. 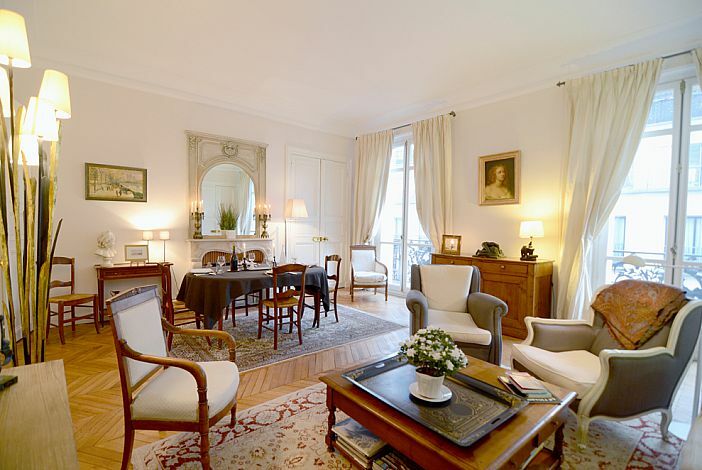 If you want a luxury apartment in Paris, stay here! Felt like we were living in Paris! Bernard's apartment is wonderful. We stayed for a week with another couple & it was perfect. We felt like we were living in Paris, not just visiting. 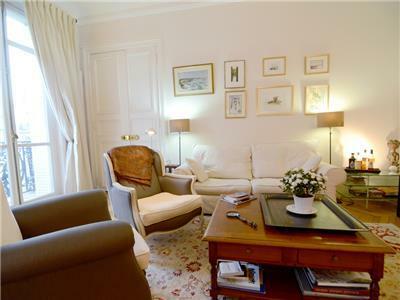 The apartment is beautifully appointed, very comfortable and in a great location. There are shops, a boulangerie & restaurants very close by. The local market has great produce too. One of our group was attending a conference, and it was a 20 min walk to the venue. Having a lift & a good AC was also very good. Bernard arranged an airport pickup, again great after a long day travelling, and greeted us at the apartment, with wine! He is a wonderful host, responding promptly and I hope that we have the pleasure of staying again in the future. Thanks Bernard! 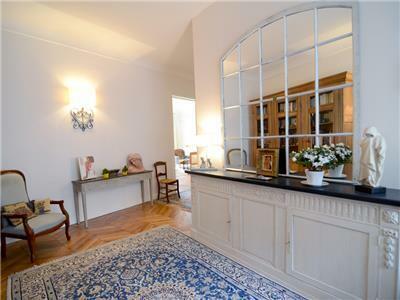 Charming and well equipped apartment, great location. A good value for money. We greatly appreciate the transfer from the airport provided by Bernard! Perfection. From the moment you are picked up at the airport until your departure, you will be smiling. 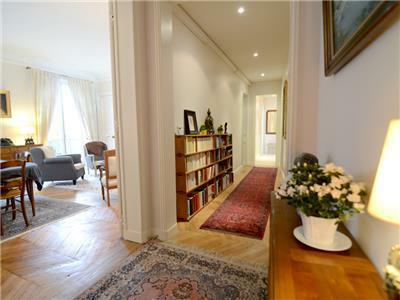 The location is great (5 min walk to George V metro). The apartment is far better than the pictures; it's beautiful! It's a perfect venue to share in 2 couples. We also loved the quiet charming neighborhood so close to the busy city. From start to finish, a wonderful experience. The apartment is beautiful and we felt look like we lived in Paris! Huge, comfortable, and excellent location we highly recommend this gem. The apartment was beautiful and as mentioned. Host was amazing and just a great experience. I will definitely be booking again with Holidays Europe Rentals. Perfect place to stay. Supermarket and bakery are a block away. 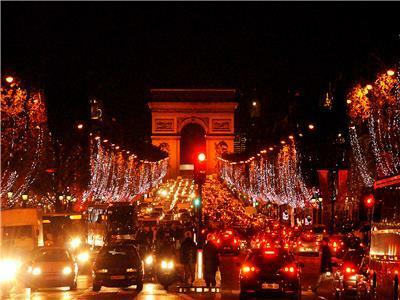 Arc de Triomphe and Eiffel Tower are a short walk. Multiple Metro stops are nearby. Many restaurants within walking distance. Pictures are very accurate. Apartment is quite large and well appointed. I will try to stay here again the next time I visit Paris. We had the best experience with Holiday Rentals Europe, it was excellent since day 1. All our emails were answered promptly, the payment was easy and safe, the pick up at the airport perfect for our family. 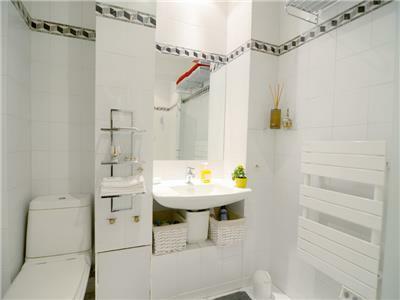 The apartment was beautifully decorated, extremely comfortable, large ceilings , nice bathrooms , and modern kitchen. everything worked perfectly for us. 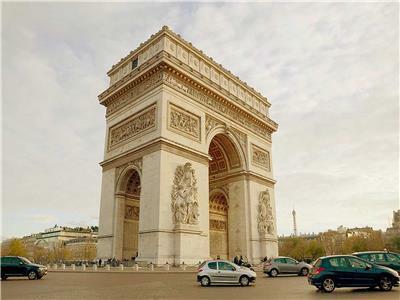 The location unbeatable few steps from Arc de Triomphe and Champs Elysées, Monoprix on the same street for groceries, restaurants and boulangeries. We highly recommend it. We had the best experience with Holiday Rentals Europe, it was excellent since day 1. All our emails were answered promptly, the payment was easy and safe, the pick up at the airport perfect for our family. 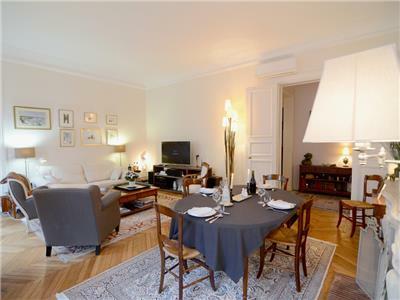 The apartment was beautifully decorated, extremely comfortable, large ceilings , nice bathrooms , and modern kitchen. everything worked perfectly for us. 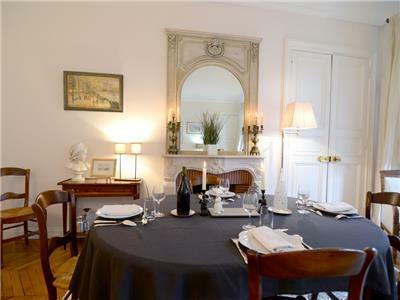 The location unbeatable few steps from Arc de Triomphe and Champs Elysées, Monoprix on the same street for groceries, restaurants and boulangeries.We highly recommend it. Es un muy buen alojamiento de buen nivel y con absolutamente todo el equipamiento para vivir allí varios días. Estupenda la ubicación cerca de todo y con todos los servicios. El anfitrión es muy correcto y atento. Volvería siempre! 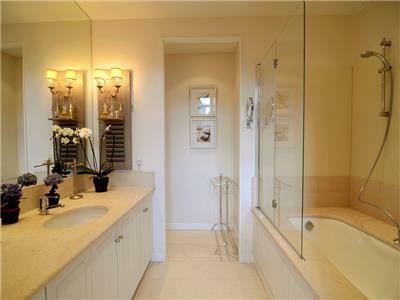 Great place, provided great places to go just about everything you want to do in the local vicinity. Very quiet neighborhood and need to be very respectful of this. Pictures are very accurate and well accommodating. 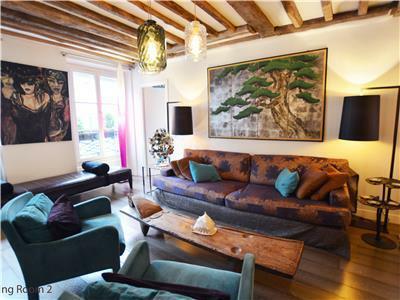 The apartment was so beautifully Parisian, and the location was amazing! 2 block walk from the Champs Elysees and yet a very quiet neighborhood. There is a grocery store, hardware store, florist, pharmacy, dry cleaner, pastry shop, and restaurants all within the immediate block. The apartment was spacious and elegant. Comfortable beds and big bathrooms. Kitchen is fully outfitted. Full washer & dryer. Bernard was a fabulous host with excellent communication! We could not have been happier and hope to return for another stay! Merci Beaucoup!